The Meaco 800i Swimming Pool Dehumidifier is part of the Meaco range of swimming pool dehumidifiers but differs in its styling from, and is appreciably more powerful than, the 500i. Rated for medium to large swimming pools this unit is significantly larger and heavier than the two less powerful models but, given its greater capability the increases are not excessive. It provides all the advantages and flexibility of the other units in the range and will be attractive to operators and owners of pools who require its high capacity. Sizing a dehumidifier for a pool is a potentially complex business and prospective purchasers are encouraged to contact the company for advice. Critical information will include the surface area of the pool in question, the air and water temperatures within the pool enclosure and advice about whether a cover is or is not used. To enable an initial "feel" for the capability of this dehumidifier the company suggests that where a cover is in use and the ambient temperature of the air is 2°C above the water temperature this unit will be capable of controlling relative humidity for a pool with a total water surface area of 118m2. Due to the hostile environment of a swimming pool with its high relative humidity and the regular use of powerful chemicals swimming pool dehumidifiers are constructed to high quality standards. The durability of this unit may be prized by the operators of other commercial premises, particularly in high humidity applications and/or where a compact wall-mounted unit is the most suitable option. Such prospective users should note that this dehumidifier is designed to work in heated areas and will not be effective at ambient temperatures lower than 15°C. The Meaco 800i swimming pool dehumidifier is nearly 40% more powerful than the 500i and suitable for a correspondingly larger pool. The water extraction rate of this dehumidifier is 148 Litres per day at a temperature of 30°C and relative humidity of 80%, conditions which are not so very far removed from those that may be encountered within many swimming pool enclosures. Prospective operators considering this unit for other applications where the ambient temperature and, possibly, relative humidity are lower should note that the amount of moisture removed will be considerably less in cooler and dryer conditions. A dehumidifier of this size will require continuous drainage and this is provided for in the Meaco 800i, by means of a gravity feed. An adjacent floor drain will be needed to dispose of the condensate and if this is not readily available a separate condensate pump will be necessary to carry the water to a more distant outlet or to raise it to a higher level. Although this is unlikely to present problems within a swimming pool enclosure the absence of an integral condensate pump may be a minor disadvantage in some other applications. A constant level of relative humidity is maintained by the Meaco 800i by the operation of an adjustable humidistat. A remote, radio humidistat is available as an option. The unit also includes an auto-restart function to restart the unit following an interruption in the power supply. A useful enhancement of the Meaco 800i is provided by a version able to heat the pool enclosure. A Low Pressure Hot Water (LPHW) heating system is included in this version in which a pipe connected to the operator's boiler passes hot water through the dehumidifier to heat the processed air. The LPHW heating system has an output of 4kW which, combined with the heating effect of the dehumidifier alone, totals 6.8kW. This version comes at a higher price than the standard model. Like the other models in the Meaco swimming pool dehumidifier range the 800i is of relatively light weight for its capacity, tipping the scales at 96Kg. It is also a compact unit with a depth of 31.0cm and a frontal area of 95.0 x 125.0cm. 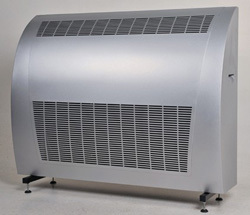 This configuration suits it for wall-mounting, usually the preferred option, but the dehumidifier may be installed on the floor if required, for which a mounting is available. If an installation outside the immediate pool enclosure is necessary or desirable the Meaco 800i can be fitted on the reverse side of an enclosure wall and operated in through-the-wall mode with ducting. The air is drawn from and returned to the pool area via two discreet grills mounted in the interior side of the pool enclosure wall. We have noted in reviews of other Meaco swimming pool dehumidifiers that the noise generated while operating is very low. The Meaco 800i is no exception and produces a modest 46dB. This is a particularly welcome feature in a dehumidifier intended for an area providing relaxing recreation. In conclusion this is yet another well designed swimming pool dehumidifier from Meaco which will continue to attract many pool operators and owners.